One of the biggest races of the year all time is happening this weekend in Hood River, Oregon, with the 6th Annual Naish Columbia Gorge Paddle Challenge attracting a massive lineup of local and international talent. UPDATE: Connor Baxter and Fiona Wylde have claimed memorable victories in the epic Double Downwinder on day 2 in Hood River, defeating one of the most competitive fields of talent our sport has ever seen. World number one Connor Baxter and local ace Bernd Roediger have dominated today’s Double Downwinder, finishing a level above one of the most competitive fields ever assembled in the sport of stand up paddle racing. Connor and Bernd crossed the line in a virtual dead heat on the 1st run, before Connor pulled ahead by just half a minute in the 2nd round to claim the Double Downwind title and cap off a clean sweep of the weekend, after he won the tight Super Lap race yesterday. The Starboard superstar showed why he’s on top of the world rankings, digging deep and getting the top result when the pressure was on, but just like Leo Nika in the Super Lap yesterday, perhaps the real story today is the runner-up, with Bernd announcing himself as a bump riding master this afternoon. Bernd, who stood up for Team Naish in the absence of Kai Lenny and Kody Kerbox (and with an exhausted Casper Steinfath still feeling the effects of his recent Olympic mission), used his supreme local knowledge to score a monumental result. Bernd made a mockery of my pre-race predictions. I did list the young gun as the “one to watch” but didn’t even find room for him in my top 10. The 2016 Gorge Paddle Challenge Double Downwinder was the single most competitive men’s race ever held outside of Dana Point (home of the BOP/PPGs), which highlights just how impressive Bernd’s result was today. For context: He finished three minutes clear of downwind experts (and my pre-race favourites) Titou and Travis. Quite fittingly, Bernd’s girlfriend, Fiona Wylde, took the championship title in the women’s race. But it was once again Connor Baxter’s day, with conbax overcoming yesterday’s extreme heat and today’s stellar field to repeat his clean sweep from 2014. 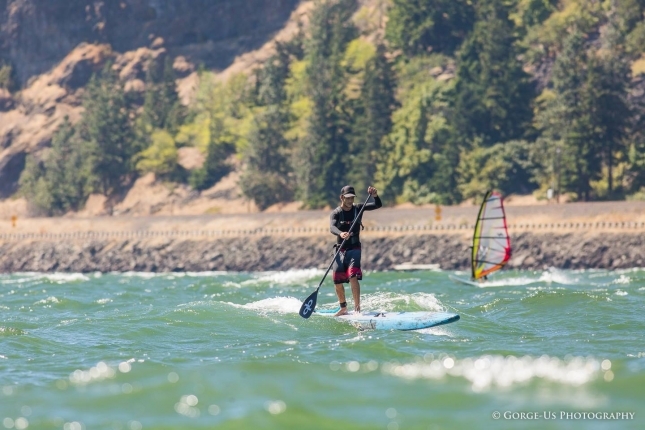 Conditions were excellent in Hood River today, with strong westerly winds whipping up near-endless bumps along the famous Columbia River Gorge. The winning times were right in line with some of the fastest runs we saw in the lead-up to the event last week. But apart from the epic duel between Connor and Bernd, there were plenty of heroics right down the results sheet though. Mo Freitas once again showed his class, finishing third to match his big result from yesterday’s Super Lap, and adding to his points haul from Huntington just seven days ago. 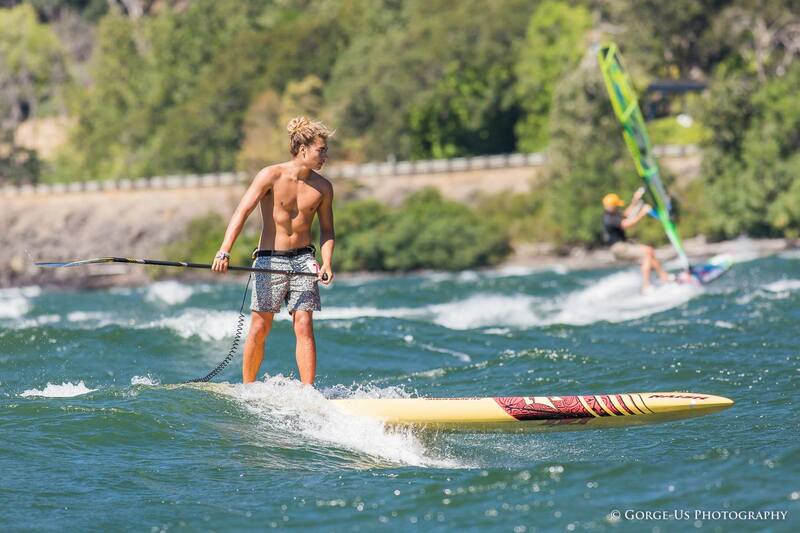 In a sign of how well respected they are in the downwind world, it’s actually surprising to see the NSP boys Titouan Puyo and Travis Grant “only” finish fourth and fifth, though considering the field assembled in Hood River this weekend, that’s still a mighty fine result. Titou bested his team mate by just 2 seconds after times from the two separate runs were combined. Other to impress included Jake Jensen, who returned to form after a bad run of results this summer, Brazil’s Vinnicius Martins, who backs up his big results in Hawaii to show he’s a force in any downwind conditions, and the Tahitian storm of Georges Cronsteadt and Niuhiti Buillard. Those four guys rounded out the top 10, with two dozen big names having to settle for the minor positions after that. We’ll have more analysis of this historic event on Monday, but here’s my quick calculation of the full Double Downwind results. 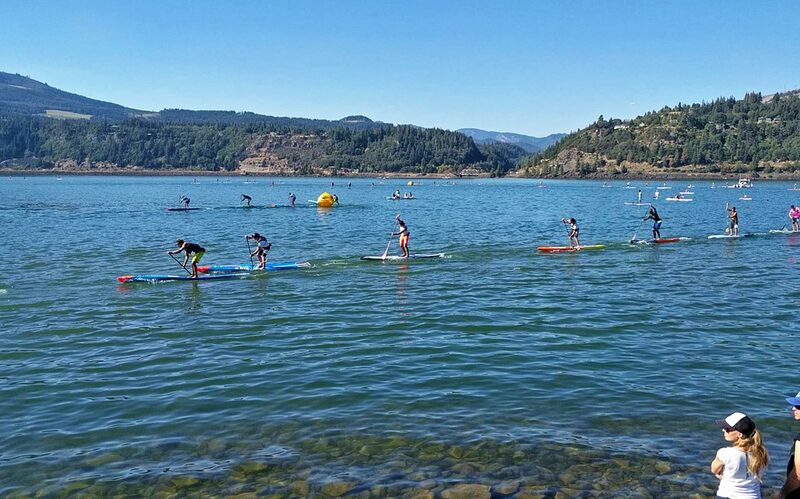 My hat goes off to the organising team – Steve, Doug, Nick and all the crew – for pulling off another fantastic edition of the Naish Columbia Gorge Paddle Challenge. This event has now cemented its status as one of the true “majors” on the international circuit. UPDATE #2: I’ve just updated the SUP Racer World Rankings, with Mo Freitas and Bernd Roediger the big movers this week. Trav and Titou losing points from their big results at the Gorge 12 months ago, combined with Mo’s huge effort over the past 24 hours, sees the Focus team rider leapfrog the NSP boys into the #2 world ranking. But it seems nobody will ever catch Connor, with the world number one bursting out to a massive lead on top of the table. Leo Nika is also a big mover after his highly impressive runner-up performance in yesterday’s Super Lap. 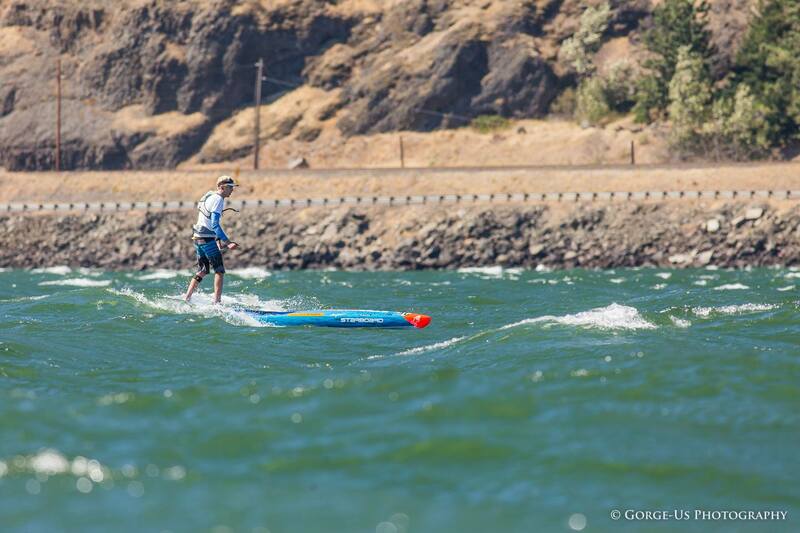 The Gorge Double Downwinder scored a massive 69.5% on the Race Index, making it the most competitive race of the year, and the second most competitive event currently in the rankings system (behind last October’s Pacific Paddle Games). Fiona Wylde makes it an absolutely memorable victory against the most competitive field of women we’ve seen in recent years, using her local knowledge to power ahead and win by more than five minutes from world number one Annabel Anderson and Australia’s Angie Jackson. This is a huge win for the hometown hero, not only because of the time gap, but also the caliber of talent that crossed the line behind her. Fiona’s win, combined with Connor’s triumph, makes it a golden day for Team Starboard (a golden weekend, actually, with the Team scoring 4 of the top 5 spots in the men’s Super Lap race yesterday). It’s quite fitting that Fiona scores the biggest win of her young career in Hood River; Not only does she call this place home, but Fiona is a product of the local JET (Junior Elite Team) training squad. The JET program, which is run by Gorge Paddle Challenge founder Steve Gates, has helped to produce the champions of tomorrow, and now it can claim to have produced the champions of today as well. Winning the 2016 Gorge Paddle Challenge, the most competitive race in women's stand up paddle history, and to have won it in my back yard… I have no words!!!! Thank you for everyone who made this possible!!! 🙈🤗💕 @bernd_roediger @hannah__hill, @macraewylde @starboardsup @bigwinds! Love you all! ❤️ And of course my sponsors, @starboardsup @wernerpaddles @oneillwomens @vmgblades @olukai @garminfitness @dakine by @davefusilli and @gregpanas, thank you! Annabel fought hard to stay within shouting distance of Fiona on the 2nd downwind run, however the race was over after the first run, with Fiona reading the bumps to perfection en route to opening up an insurmountable four minute lead. Annabel showed her raw strength to comfortably win the Super Lap race yesterday, but Fiona showed today there’s no substitution for local knowledge when it comes to reading the conditions. Angie was also impressive, and was the only other woman to get anywhere near the top two. The Aussie has been stationed in Hood River the past few weeks doing runs with Fiona, and that preparation proved invaluable as she almost reeled in Annabel on the 2nd run. Angie’s fellow Aussie, Terrene Black, and impressive local wildcard Hannah Hill (another product of the JET training program I believe) traded fourth/fifth place finishes, with Hannah getting the edge on combined times, while several young guns showed their future world-beating potential with excellent results. Apart from Hannah, that new wave that’s invigorating the women’s sport includes the likes of Manca Notar (6th overall), Shae Foudy (7th), Kali’a Alexiou (10th), Jade Howson (11th) and Annie Reickert (top 10 on the second run and 15th overall). With 9 of the top 10 world ranked women competing, and with plenty of other big names from the Top 50 on the start line, the Double Downwinder scored a mammoth 72.5% on the Race Index, making it the single most competitive race in living memory. For context: This event was even more competitive than the mighty Pacific Paddle Games, which hit 63% last October. We’ll have more analysis of this epic race tomorrow, but in the meantime here are the full results. I’ve also just updated the women’s World Rankings, with Fiona moving oh so close to the world number two position. Plenty of other big movers right down the leaderboard, including young guns Manca, Jade and Kali’a. It was a hugely dominant performance from Annabel Anderson, with the world number one finishing more than a minute ahead of an all-star field. As we predicted, Candice was the strongest of the women behind the New Zealander, however it was a tough fight for the runner-up spot, with Fiona Wylde and Shae Foudy pushing Candice all the way. Angie Jackson rolled the dice and took her super lap early, however it didn’t pay off as she lost virtual ground to the other podium contenders while she was on her own. Youngster Jade Howson was very impressive in finishing seventh. We’ll have a full recap and more photos/videos later, but for now here are the full results as well as the points for the SUP Racer World Rankings. Tomorrow (Sunday) it’s the 6-star (minimum 60%) Double Downwinder. We’ve also just updated the Men’s Super Lap results as well as the Grom Race results. World number one Connor Baxter does it yet again, claiming the victory ahead of an incredibly stacked field of elite talent. However Connor was pushed all the way to the line by his highly impressive Starboard team mate from Italy, Leonard Nika. We all know that Connor is an absolute superstar, but Leo has really cemented his position as one of the world’s top-tier athletes over the past few months. He was the winningest athlete on the EuroTour, while he looked strong in Huntington last week as well. Leo has been hovering inside the top 20 on the World Rankings for the past couple of seasons, but I suspect he’ll burst into the exclusive Top 10 club after this weekend. Leo’s result also gives Starboard a one-two finish today (and, quite incredibly, four of the top five spots). Very strong effort from Mo Freitas to back up his victory at Huntington last week — he’ll surely be confident of another top finish in tomorrow’s downwinder. Trevor Tunnington was equally impressive, sitting with the front pack the whole way to secure a top four spot. Travis Grant, who was runner-up in this race 12 months ago, was there the whole way but faded in the final 50 metres to settle for 5th. Look for Trav to improve his result tomorrow though. And although he finished 7th, it was a very impressive race for Titouan Puyo. The NSP team rider had a shocker of a start but gradually worked his way back through the field, only to fall at the end of the first lap when he was in touch with the leaders. He then powered back for a second time, and if it wasn’t for those two small mistakes, he probably would have been in a position to win given how strong he looked. Great effort from Niuhiti Buillard, who scores a top 10 despite being much more heavily favoured in tomorrow’s Double Downwinder. The Tahitian, along with his compatriot Georges Cronsteadt, is now looking good to secure a pair of top 10 finishes this weekend. Casper Steinfath and Slater Trout went out hard and led the pack early, but were eventually gobbled up by the field. At first I was really surprised to see Casper fade all the way down to 17th – I had him as a podium contender – but when you consider he’s just flown back from a stand up paddling mission to the Olympics in Rio, you can probably forgive him for the relatively poor finish today. For much of the race, the lead breakaway pack consisted of Connor, Mo, Trev and Trav, however Michael Booth and Leo made excellent use of the Super Lap to close the gap at the start of the final loop. I thought Boothy might have had the lungs to power over the field in the final few hundred metres, but Connor was just too strong today. There were some big names finishing outside the top 20, which highlights just how crazy the level of talent in Hood River this weekend really is. 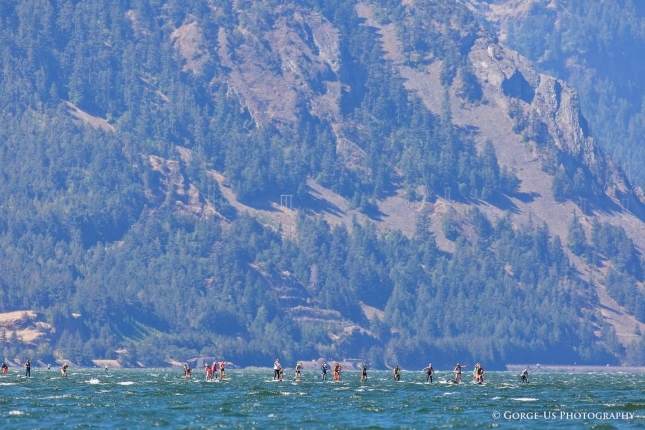 As we talked about in our Gorge Paddle Challenge Preview, this year’s showdown will be the single most competitive event ever held outside of Dana Point (home of the BOP/PPGs). It was a hectic race out there today, and once again the Super Lap format that Paul Jackson invented proved itself to be an exciting addition to the sport. It was also HOT, with the mercury tipping close to 40 degrees (over 100F). There was no wind, which didn’t help, though fortunately it looks like the breeze will kick back in tomorrow morning, just in time for the big 6-star Double Downwinder. Interesting bit of trivia: The average age of the top five guys is 23 years, while the average age of the next five guys (i.e. 6th-10th) is 32.4 years. Or in other words: Almost exactly a decade difference. It’s difficult to draw any real conclusions from this, as the course race was so tight that you could have thrown a blanket over the top 20 guys, but it’s an interesting little stat nonetheless. Speaking of throwing a blanket: There was just 1 minute and 46 seconds separating 1st (Connor) from 20th (Lincoln), which highlights just how close the racing was, and just how high the level of competition is that so many guys can hold such a high pace for almost an hour. Ok so that was the very hot, very flat Super Lap race. Good stuff. Now let’s get ready for the main event, the big Double Downwinder, which is coming up on Sunday. Looks like the wind is going to be firing again tomorrow, so we should be in for another great day of racing! Congrats to Tyler Bashor and Delila Quinn for taking the top spots. Impressive performances from all these charging grommies — definitely a good sign for the future of the sport! I’ll post the results from the Open Race shortly (which was won by Haakon Hoyer-Nielsen), but in the meantime you can get all the raw results, including open race finishing times, over on Paddle Guru (the Open Race result are split between “Course Race Open Men” and “Course Race Open Junior Boys” but it was the same race).